This training is for anyone using versions 2, 3, or 360. Storyline is an e-learning authoring tool that’s simple enough for beginners and powerful enough for experts. It allows you to create interactive professional-looking e-Learning courses. 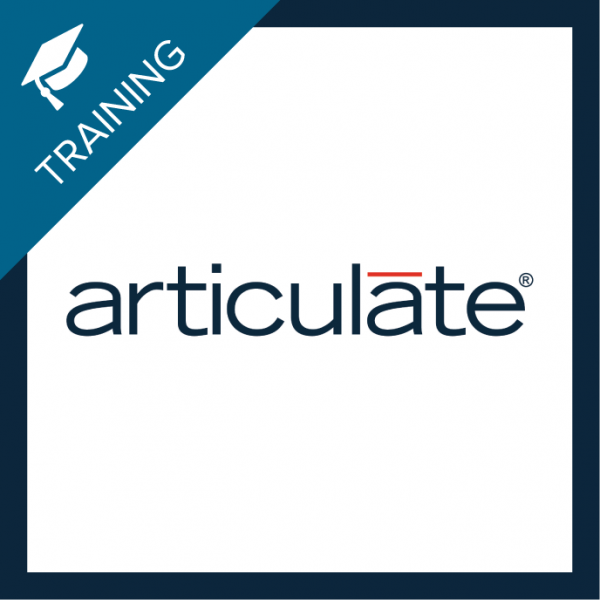 Our Articulate Storyline training focuses on teaching course developers how to create quality training titles, demonstrations, interactive simulations, branching scenarios, and quizzes without any programming. You’ll begin the process of creating an e-Learning project. You’ll create a project from scratch, add scenes and slides, apply masters, and import content from Microsoft PowerPoint. You’ll add common slide elements as text, images, characters, and captions. You’ll also learn how to create and format shapes and work with a bulleted list. Triggers are the key to interactivity. Triggers can be attached to slides or slide objects. They control what happens when a learner interacts with a slide object or enters or leaves a slide. During this module you’ll use Triggers to slide objects. You’ll also work with Hotspots, areas of a slide that can be made interactive. You’ll learn that you can draw a Hotspot on top of anything and quickly use Triggers to initiate the interactivity. Variables serve as buckets for data. The data can be used to provide feedback to the learner and/or allow you as the developer to create conditional scenarios. Learn to add voiceover audio to an e-Learning project. You’ll learn how to import, record, and edit audio. You’ll also learn how to animate Storyline slides, and how to insert videos. You can use Storyline to create screencast videos of anything you can do on your computer. During this module, you’ll capture a video and insert it into an existing Storyline project. You’ll also learn how to publish your finished eLearning project for the widest possible audience. "I went from not knowing a thing about Articulate to really enjoying building a project." "A really great walk-through some of the major elements that make Storyline so powerful. It will definitely help me in my day-to-day work." This class is delivered online via GoToTraining. While we try to cover everything in class, there are bound to be questions that arise as you continue to work with the Articulate Storyline product. We offer exclusive one-on-one support to aid with any questions or problems that may arise as you begin to master Articulate Storyline. We do not simply take your problem or question and fix it, but rather work with you to troubleshoot the issue and build on your previous training experience.